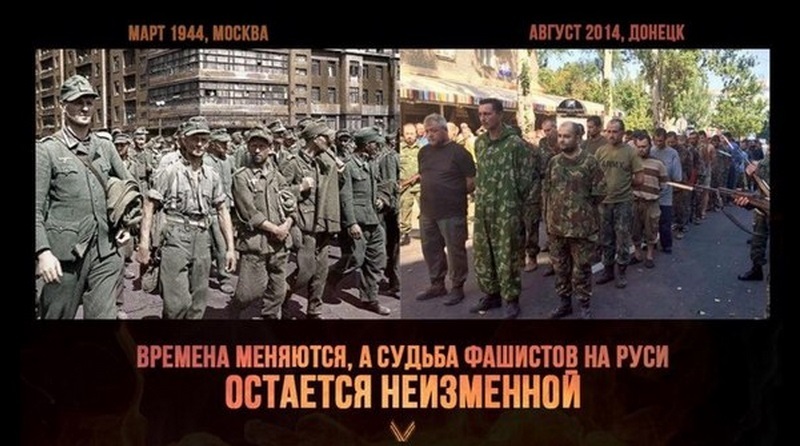 00-00, Summaries of New Russia militia. "During the day, the situation has not changed significantly. The enemy has not carried out large-scale fightings, there have been rather defensive actions. 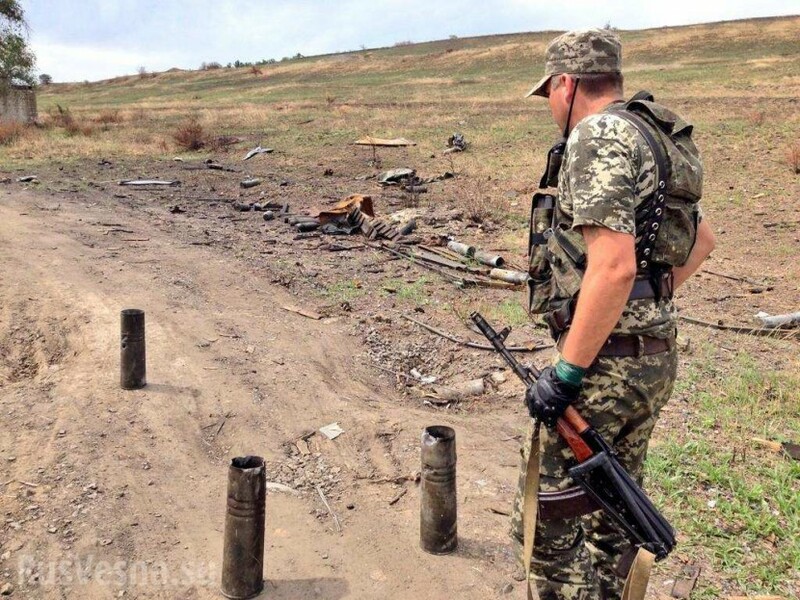 At the direction of Lugansk punishers hold their positions and conduct regrouping. 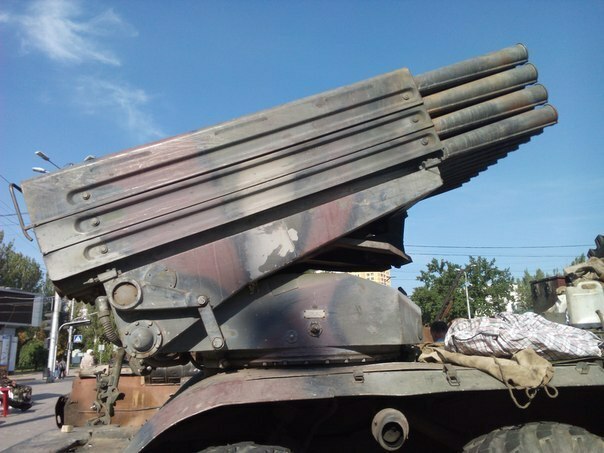 Enemy artillery continues to shell residential areas and other civilian objects in Donetsk, Luhansk and Ilovaisk. In Olenovka pocket, in which are the National Guard units "Azov" and «Dnepr", militia units continue eliminating of encircled punishers. Units of the enemy blocked to the south-east of Donetsk undertook separate unsuccessful attempts to break the blockade. Junta troops left most of the roadblocks and occupied strong points. 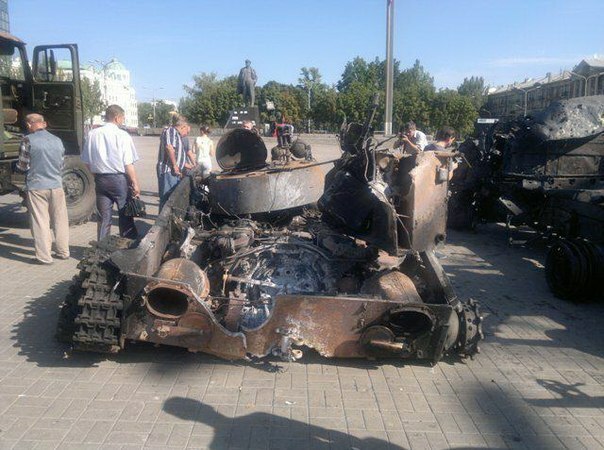 Artillery units of the Army of the People's Republic of Donetsk have destroyed up to 18 pieces of military equipment, up to 185 punishers were killed and wounded. In the area of Kuteynikovo the day before 5 punitive MRLS were destroyed. 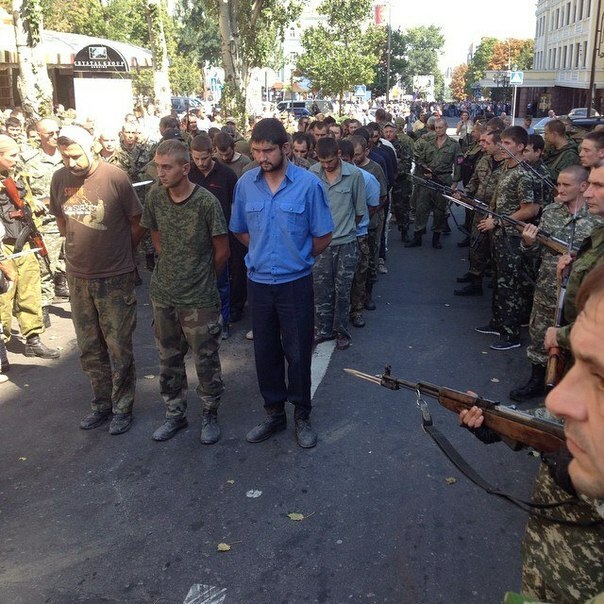 Near the village Mikhailovka 30 completely demoralized Ukrainian soldiers surrendered to the militia. " 23-17, The issue of Ukraine's accession into NATO is not considered, said German Chancellor Angela Merkel in an interview to ARD. Merkel said that Ukraine's membership in NATO is not urgent. «We can offer Ukraine a certain kind of co-operation, but the question of its accession to NATO is not on the agenda». 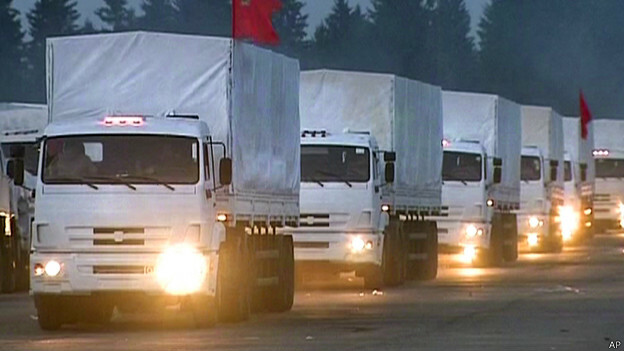 The head of the People's Republic of Lugansk Igor Plotnitsky said that on August 25 at eight in the morning all points of issue of humanitarian aid supplied by Russia are opening in Lugansk. There was so much freight that it had been counted all last night long, and today work will continue until late evening. From tomorrow all Lugansk residents will receive aid on issuing points, now all is packaged, we hooked up volunteers. The aid will be given to people in sets. Everyone will have it - said Igor Plotnitsky. It was originally planned to open 24 issuing points, but their number increased to 26. Their doors will open at eight in the morning on August 25. - We are grateful to the Russians ... I saw people crying, meeting humanitarian aid, crying, when the trucks were leaving. For us Russia is a real brother - told LifeNews one of the volunteers, a resident of Lugansk, who had been packaging sets with the others in warehouses. 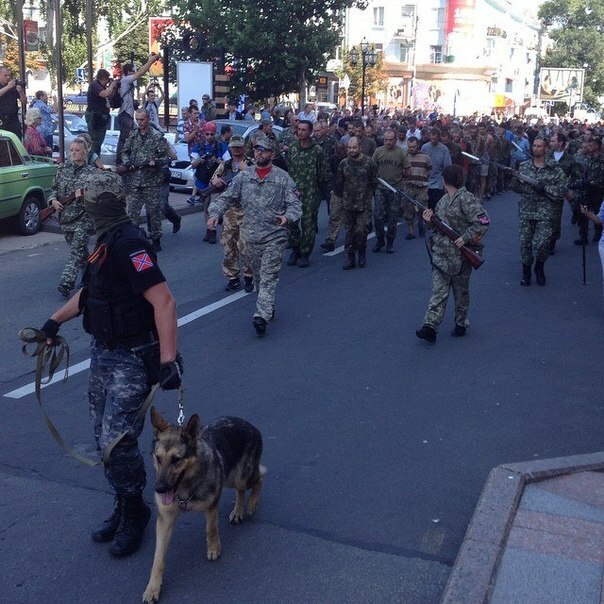 21-45, In Donetsk the situation remains tense. 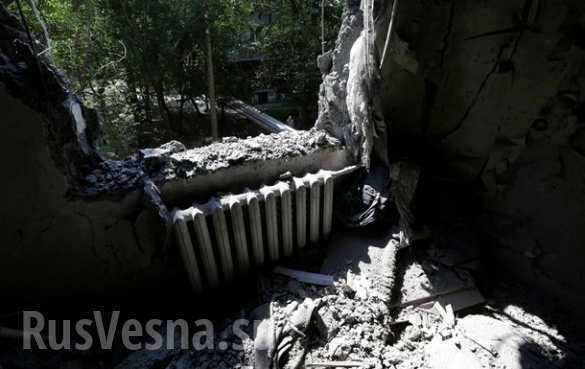 Deadly shrapnel wounds received two civilians in the Leninsky district of the city, the press service of the Donetsk Regional State Administration reported. It is noted that the attacks were carried out today in all areas of the city, but Leninsky district suffered most. UPD: 14:50 (GMT) In the direction of Artemovsk two SA-18 Grouses hit a plane (which is specified), the plane fall was observed from Seversk. UPD 1: Information has already passed, but it required clarification: fearing of the next encirclement divisions of Ukrainian fascists together with the policemen enforcement given to them (transit police), left Volnovakha town in the first half of the day. UPD 3: 19:20 (GMT) in the Kalinin district there was a loud single shot, the shot was heard in many parts of the city. UPD 4: 20:00 (GMT) Ukrainian fascists resumed shelling, shots heard in the Proletarsky, Petrovsky districts, in the area of ​​mine Octyabrskaya, in the Leninsky district of Makeyevka. Presumably the blow was made by MLRS cluster munitions with high-caliber (Uragan) from the airport. 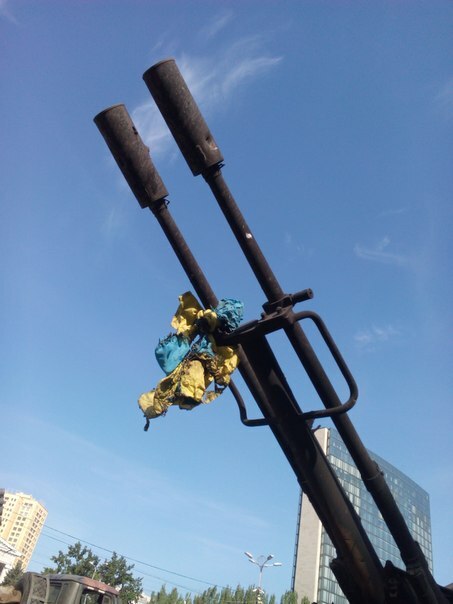 UPD 5: Confirmation comes that the fascist junta has used cluster munitions in residential areas of Donetsk, it can be said already fairly that the fire was opened out of the MLRS "Uragan". After the shelling only in the area of Engineering plant, by this time, one person died and four were wounded, two of them heavily. 19-04, "the General Headquarters of the Donetsk People's Republic Army decided to abandon the actions of small units and start war fighting with full-fledged detachments and individual military units that incorporate a full set of fire support means," - said the staff. On the basis of existing militias squads three infantry brigades formed. Number of Ukrainian servicemen voluntarily sided with the DPR and the miners of Donbass additionally created a separate Volunteer Regiment. 18-35, In a special report released by the OSCE, the facts of the deaths of civilians and destruction from artillery fire in the Kalininsky district in the north of Donetsk recorded. OSCE observers spread Sunday special report recording the fact the deaths of civilians and destruction from artillery fire in the Kalininsky district in the north of Donetsk. According to the report, the observers were at 17:15 local time on August 23 at a place that, according to locals, was shelled at 16:30. 17-55, two ballistic missiles fired from the city Artemivsk which is under the control of the National Guard of Ukraine in the direction of Donetsk. Fires were released with a time lag of an hour, according to civil journalists. Earlier militia had already recorded evidence of the use of ballistic missiles by Ukrainian army and even had found their fragments. 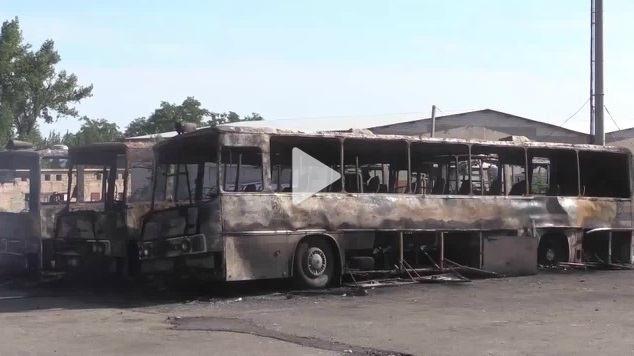 Bus station in Donetsk became the target of Ukrainian artillery early in the morning on August 24. As a result, destroyed school bus. 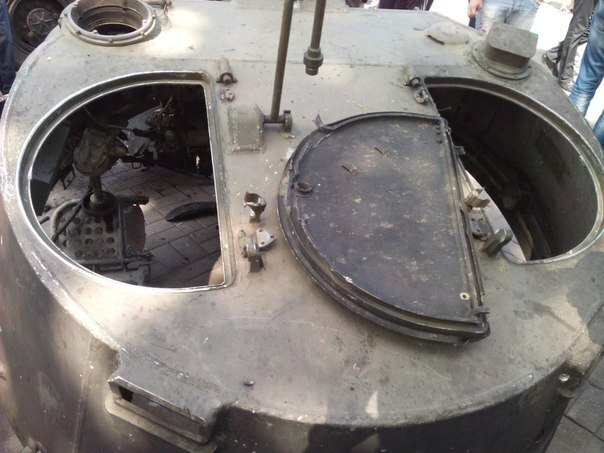 The first shell hit undermined the gas tank. There was an explosion, one of the workers of the transport company lightly wounded. 15-15, Military equipment, which has been involved in the parade on the occasion of the 23rd anniversary of Ukraine's independence, will go to the military operation zone. This was reported by the press service of the Ukrainian president. 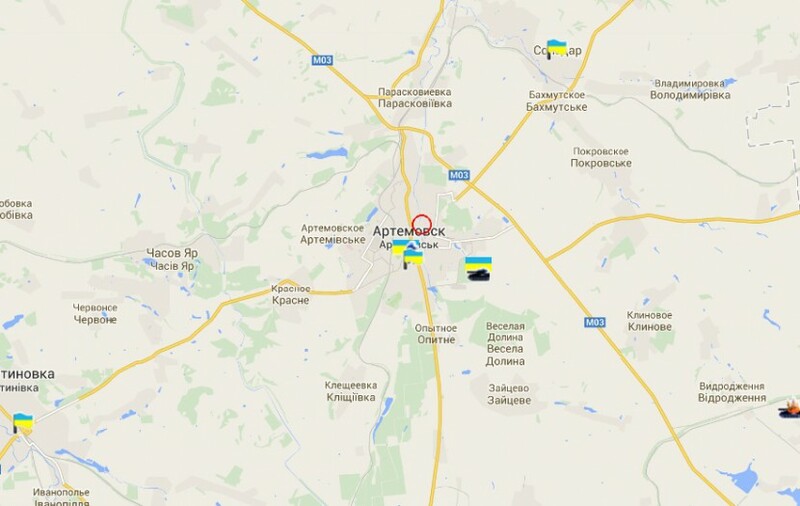 In Yelenovka (near Donetsk) there has been intense battle since 4 am(Grads, howtizers, tanks). At night there were shootings in Mariupol in the vicinity of the airport (where there is the base of the occupying forces) - militia intelligence must have been having a good time again. 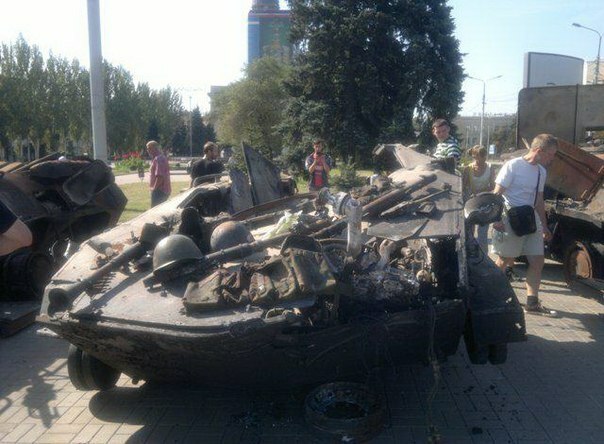 Due to the significant loss Kolomoiskiy’s assistant requests Geletey to bring 25th brigade from the area of ​​the ATO. The brigade should be redefined. In the 80th the same thing - the paratroopers in the Lugansk airport and Khryaschevatoye even ask journalists for help. "In Lugansk region, near the village of Ural-Kavkaz (Krasnodonsky district) our troops were dropped at 20.35. After landing from the area of ​​intended landing flare soared, 4 rapid response teams of militants immediately left to the area, "- said Snegiryov. 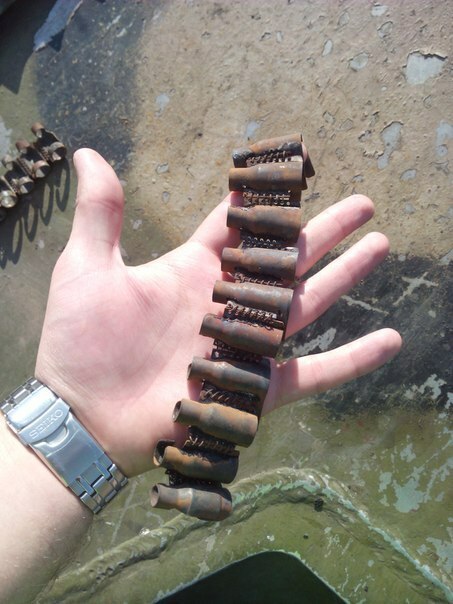 However, he added that «at about 21.30 militants’ «Grad» worked near Sukhodolsk from the Black Lake over alleged Ukrainian assault landing square, so as howitzers - from the Sukhodolsk labor camp №36." According to Snegiryov here "there is every reason to assume that the time and place of landing was known by rebels in advance, the group had been ratted out." First about the fighting in the coastal area. 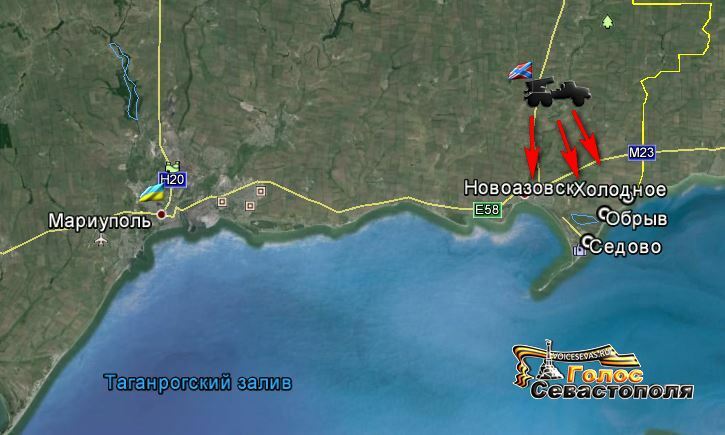 Just recently it might have seemed to someone ridiculous, but today the fighting began in the area of Novoazovsk where a powerful host defense was created in April and there is a hodgepodge of different parts of the combats of questionable capability covering up the border with Russia. After creating the Southern Pocket 2.0 militias began to probe the other checkpoints southwest of Marinovka and were surprised to find that there was almost no covering, everything was strapped to the main front lines, and to the south of Amvrosiivka there was a gap, which was only partially covered by screening forces. Surely, the first SRG of militias began to sneak to the south-west, which led to cleaning up of the checkpoint "Uspenka". After that operational void was formed before the militia down to the coast, as there have not been major powers. As a result, several SRG advanced almost to Novoazovsk and the settlements Kholodnoye and Sedovo, conducting a few disturbing shootings and attacks on checkpoints. 13-12, in the headquarters of the militia the information confirmed about the beginning fighting in the area of settlements Dolya and Yelenovka in the direction of Mariupol. "There is a battle at Yelenovka. According to preliminary information, the checkpoint of the Ukrainian armed forces between Yelenovka and settlement Dolya passed under the control of the militia "
11-48, Army Headquarters of Donetsk People's Republic issued a statement. It is reported that after prolonged positional battles on the territory of the People's Republic of Donetsk the army of DPR within the last day has launched a counteroffensive. During the offensive, blockage of a powerful group of Ukrainian Army in the area of settlements Voykovsky, Kuteynikovo, Blagodatnoye, Alekseevskoe, Uspenka and Ulyanovskoye was completed. There are also reports that militia encircled two groups of Ukrainian law enforcers with total number of seven thousand soldiers. In the "ring" there were the headquarters of the 8th Army Corps, AFU 95th airmobile brigade, 28th and 30th mechanized brigades, as well as punitive battalions "Aydar", "Shahtyorsk" and "Donbass". 11-01, In the morning Kalinin hospital was fired in Donetsk. It is reported by the correspondent of "KP" Dmitry Steshin. 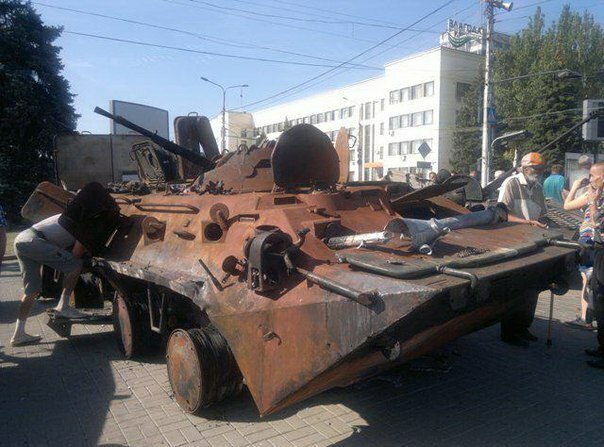 10-27, Army of Novorossia fights for access to the Sea of ​​Azov. It is reported by news agency "New Russia". Now the main action takes place in the city Novoazovsk. In Donetsk, the new fire by Ukrainian security forces led to the deaths of five civilians. Three of them were in the Church of St. John of Kronstadt, where at that time there was evening service. Shell hit the roof of the building. Another six parishioners were hospitalized. The same fire hit the hospital. 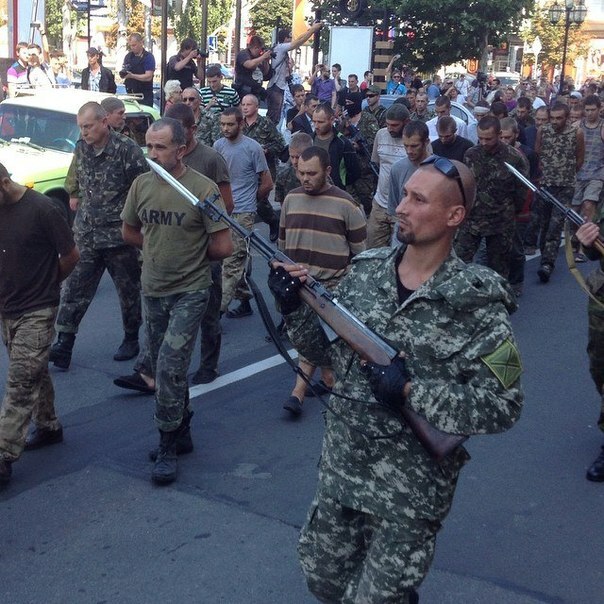 9-56, on Sunday, August 24, the DPR government claimed preparing their own "Parade" in Donetsk on Ukraine's Independence Day. "The parade will be held in the city center. 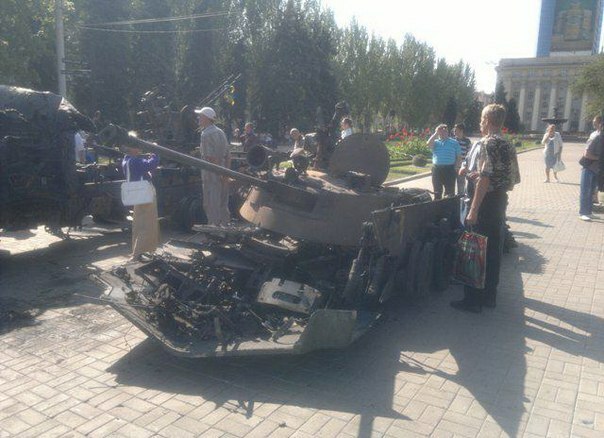 Ibid, on Lenin Square, the captured UA military equipment will be on display," - said the representative of the General Staff. According to the representative of the staff, this order is already signed by DPR Prime Minister Alexander Zakharchenko. 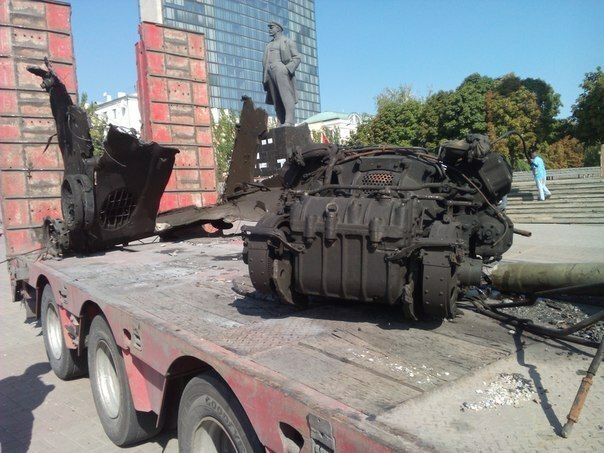 According to him, the equipment is now being installed on Lenin Square. Their rally DPR has planned for 14.00 Moscow time.